Black Portraitures II: BLACK GIRL MAGIC – Nikki G Ph.D. These hashtags have come to mean much more in the last year. The #SayHerName movement encourages us all to remember the cis and trans black women who have been killed during altercations with the police or while in police custody, especially in the wake of the possible suicide of Sandra Bland while in a jail cell in Texas. We need to recognize women cross the country who continue to work within social, cultural, political and academic programs, movements, and institutions in order to advance black people across the country and around the world. This is my small tribute to those women I met or reunited with in Florence. Deborah Willis was the driving force behind the Black Portraitures II conference along with a hardworking team of collaborators from New York University, Harvard University, the Studio Museum in Harlem, among others. Dr. Willis is University Professor and Chair of the Department of Photography & Imaging at the Tisch School of the Arts at New York University. Dr. Willis has worked throughout her entire career to highlight and celebrate the creativity, talent, and beauty of African Americans, primarily (though not exclusively) in photography. Because of her and the wonderful conference staff members, BLACK GIRL MAGIC was palpable throughout our time in Florence. 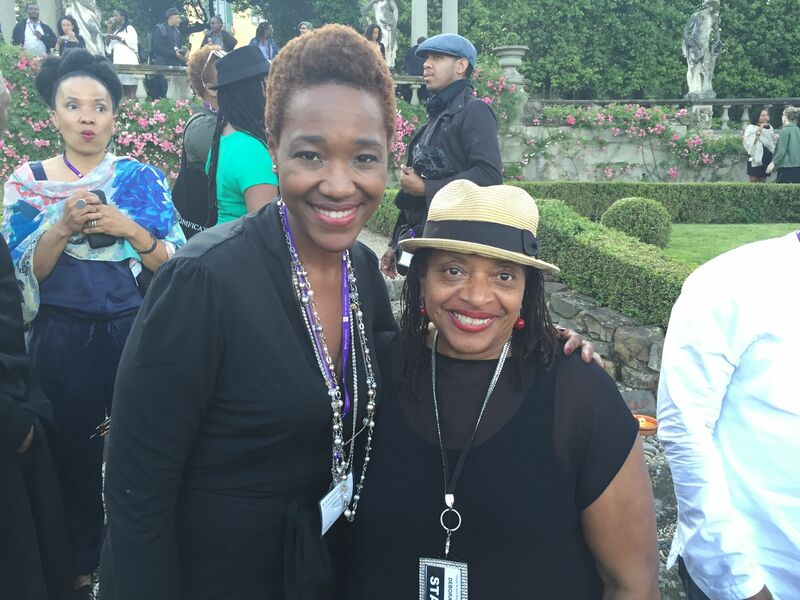 Dr. Deborah Willis and Dr. Nikki A. Greene. Black Portraitures II Reception at Villa La Pietra, Florence, Italy. As a photographer, curator, historian and documentarian, her commitment to the arts is unequal to most academics today. Her numerous books include Posing Beauty: African American Images from the 1890s to the Present; Out [o] Fashion Photography: Embracing Beauty; Reflections in Black: A History of Black Photographers – 1840 to the Present; Let Your Motto be Resistance – African American Portraits; Family History Memory: Photographs by Deborah Willis; VANDERZEE: The Portraits of James VanDerZee; and co-author of The Black Female Body A Photographic History with Carla Williams; Envisioning Emancipation: Black Americans and the End of Slavery with Barbara Krauthamer; and Michelle Obama: The First Lady in Photographs (both titles a NAACP Image Award Winner). Most recently, inspired by Deborah Willis’s book Reflections in Black, Thomas Allen Harris’s film Through a Lens Darkly premiered at Sundance in 2014 (and is now available on Netflix). THANK YOU, Deborah Willis, for bringing us together so that we can continue to do “the work.” You’re an incomparable mentor and inspiration to so many of us. 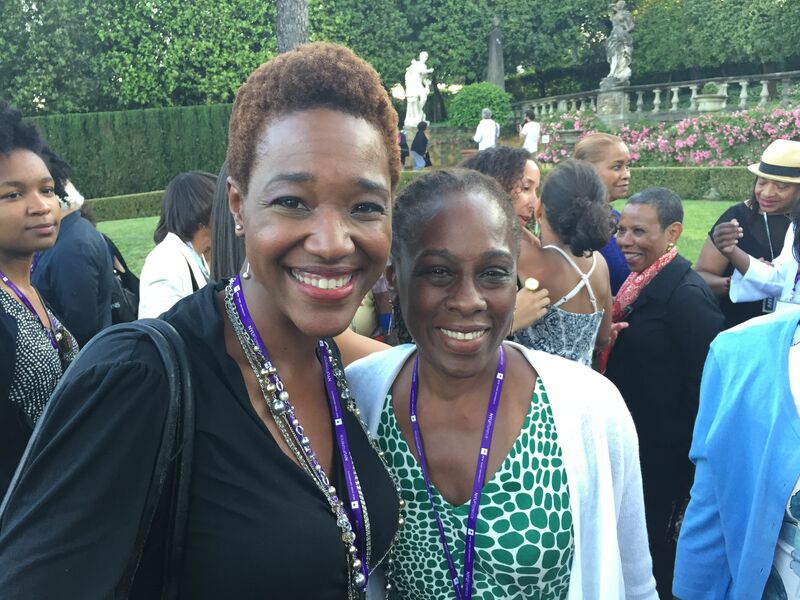 Chirlane I. McCray, 1st lady of NYC and Wellesley graduate with Nikki A. Greene. Black Portraitures II Reception at Villa La Pietra. We occasionally owned the streets of Florence. Right, Jasmine E. Johnson?! There was a paper on BETTY DAVIS by De Angela Duff! Thanks for the shout out for my “Feminist Funk Power” article during your presentation! Ultimately, all we needed to do was just stand around and see all of the beauty, talent, and intelligence that inhabited the spaces of the Odeon Theater and Villa La Pietra in Florence. As a result, WE WERE ALL BLACK PORTRAITS worthy to behold. Dr. Mary Schmidt Campbell, Spelman College’s new president w. Nikki A. Greene. Mickalene Thomas poses before the portrait of her mother. Lyle Ashton Harris, Courtney Martin, Nikki A. Greene, Imani Uzuri. Dark Room Members at Black Portraitures II. Dr. Brittany Cooper discussing #SayHerName. Photo by Nikki A. Greene. Christina Sharpe presenting on Dark Room Roundtable. Blackness in the Public Sphere. Photo by Terrance Jennings. 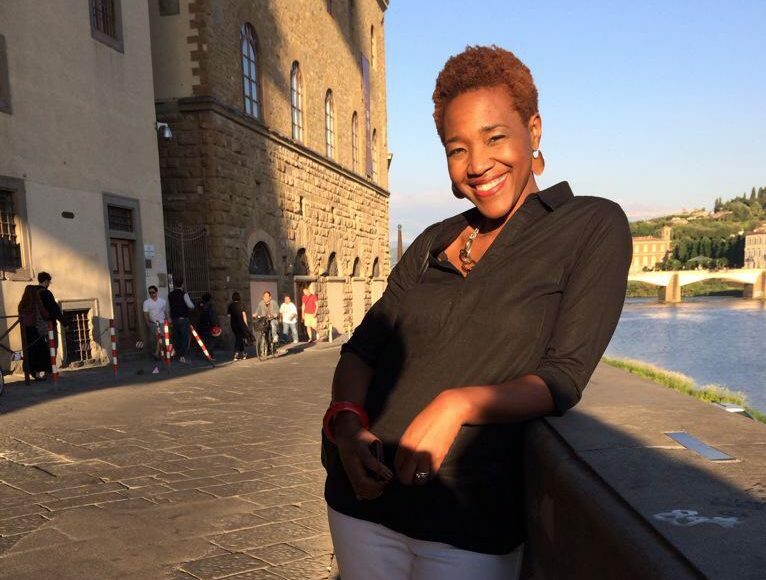 Jasmine E. Johnson at Villa La Pietra. Photo by Nikki A. Greene. Imani Uzuri preparing to give us her all in song. Photo by Nikki A. Greene. Dr. Leigh Raifford & Dr. Nikki A. Greene. We went to Wesleyan together! De Angela Duff presents “Black Female Rockers: Betty Davis to Joi.” Photo by Nikki A. Greene. Celebratory last feast in Florence. Imani and I meet feminist scholar Michelle Wallace. Black Portraitures II. Carrie Mae Weems photographing while Mickalene Thomas discusses her work. Ponte Vecchio, Florence, Italy. Photo by Nikki A. Greene. Dr. Mary Schmidt Campbell, new president of Spelman College, discussing Romare Bearden. Photo by Nikki A. Greene. Dr. Ebony Coletu and Nikki A. Greene. Kwami Coleman, Nikki A. Greene, Imani Uzuri, Matthew D. Morrison, and moderator Hank Thomas. Black Portraitures II Conference, May 30, 2015. Photo by Deborah Jack. Renée Mussai of Autograph ABP presents. Photo by Nikki A. Greene. Il Duomo at night. Photo by Nikki A. Greene. Nikki A. Greene presenting on Radcliffe Bailey. Photo by Kimberly Juanita Brown. Joan Morgan speaks. Photo by Nikki A. Greene. Under the Tuscan sun at the Villa La Pietra. Photo by Deborah Jack. Thank you to the amazing staff members in the green room during the conference. Dr. Cheryl Finley, one of the co-organizers of BPII and Wellesley alum! Uffizi Gallery. Florence, Italy. Photo by Nikki A. Greene.